Alaska was Russian before it was part of the United States, and the Russian influence is still felt - especially in the Orthodox religion and religious architecture. In 1879-80, the Pribilof Aleuts celebrated the Russian Orthodox Christmas, rather than the Western, December 25th, Christmas. 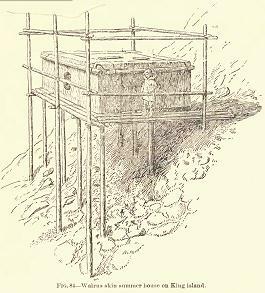 In 1879, Libby Beaman followed her husband to St. Paul Island in the Pribilofs - remote islands in the middle of the Bering Sea - when he was appointed as a government agent to supervise the local fur seal harvest. Beaman was a remarkable woman - the ship captain who took her thought she was the first western woman to go to the Aleutians and the Pribilofs. She was repeatedly warned off, because of the rigors of life there. The village of St. Paul... presented a pretty picture. It is built up a steep slope away from the harbor, where small boards of skin called bidarkahs and the bidarrahs are pulled up on the little wharf. Low hills surround the village... Government House... sits high on the central slope overlooking the roofs of the other houses. But it is not Government House that dominates the scene. 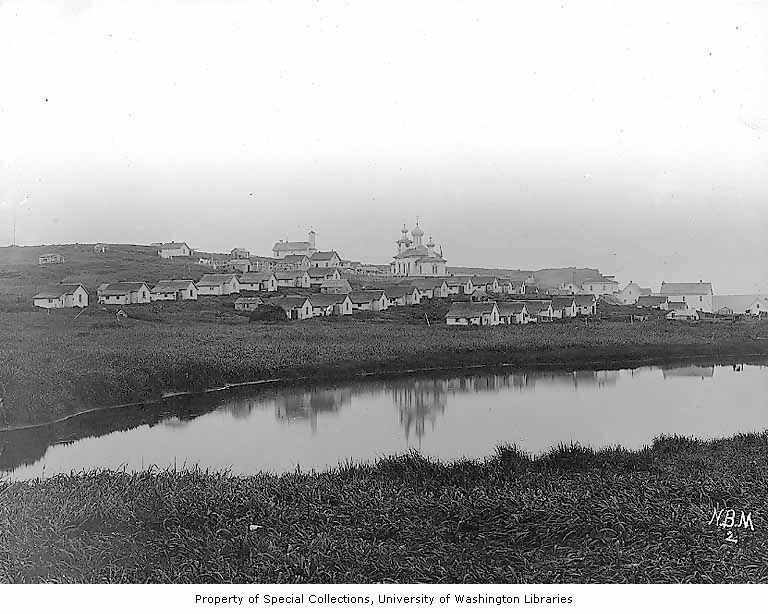 The vivid blue onion dome of the Orthodox church gives cohesion and charm to the scene and gathers unto itself the neat white frame buildings of the Alaska Commercial Company and the eighty white frame houses of the eighty Aleut Families it serves. St.Paul Island was uninhabitated when the Russians arrived in Alaska. The Russians introduced the Aleuts to the island in the 1790s to harvest fur seals. When the Beamans arrived in 1879, the Aleuts had been there for almost 90 years, almost 80 of these under the Russians, and just over ten under the Americans. At this time, the fur seal harvest was conducted by the Alaska Commercial Company. The Company had leased the harvesting rights from the government. Jeanne van Nostrand tells the story of the seal harvest during this period: “The seals are about gone…” (American Heritage, June 1963). van Nostrand is critical of the Company's operations, and of the government agents - implicitly including Beaman's husband - who supervised them. This picture was obtained from a University of Washington online collection. Several other 1896 photos of St. Paul Island are available there. John and I celebrated a very quiet Christmas Day, December 25th, with the men at the company, who kept repeating, "Just wait until Russian Christmas. That's the day!" So we did wait until Russian Christmas, which was celebrated on our Feast of the Epiphany, January 6th, yesterday. After the many services all day long at the church, large, lighted stars - something like our Fourth of July pinwheels - were brought out about 7:30 P.M. They were set to whirling in front of the church. While they were in motion, many Christmas hymns were beautifully sung with great animation. The natives' voices were particularly lovely in the night air and were very stirring at times. The star bearers took up their stars, and numbers of people fell in behind each bearer to form small groups that wended their ways in different directions all through the village. As I watched from our high windows, the lighted star processions moved like constellations in the inky bowl of night beneath us, traveling from house to house, stopping to sing and exchange greetings at each. The scene beneath us weas a moving one, earnestly entered into. Antoin Molevidoff and Kassian Nickolai, both star bearers, stopped with their groups at our house. Antoin's star was made of glass, about four feet in diameter, decorated with flowers painted on the surface. In the center was a chamber where candles burned. It was so made that it could be whirled to appear like our pinwheels. This required a second person to help, and it is an honor that every young melchiska seeks, to help whirl the Christmas stars. The decorating had been done by Heerman Antimonoff, son of the first tyone, a monk who occasionally assists Father Paul and who never has had any art training. We have struck up quite a friendship through our art. The second star to stop at our house belonged to James Butrin, George's brother, who let Kassain carry it. This one had a transparency in the center upon which was drawn the U.S. flag, the eagle, and the thirteen stars arranged in a semicircle above its head. The group that followed it was mostly the young boys and girls whom I had been trying to teach at the school. We invited them in for chia and sweets - rather slim Christmas fare, but the best we could do because of the bad weather that preceeded these two fair days. This is the only feast at which the women and girls may join in the singing, which makes it a gay and delightful occasion. I felt rewarded because each one spoke only English while in our house - not much and brokenly, but understandable. They are trying, and they are pleased because I complimented them. When they left, they stood outside our door and repeated many of the songs. Then whirling their stars and chanting softly, they disappeared into the night. Russian Christmas - Aleut style! Just as Russian Christmas is late, so is New Year - January 13th on our calendar, New Year's Day on theirs! Like the Chinese, they celebrate it with fireworks, bombs, cannons, and singing in front of the church. Seven-foot transparencies have been erected on the plaza in front of the company quarters. The first one has two Russian eagles with their talons on a drum and connon. There are crowns on their heads. Another transparency has our eagle with the thirteen stars above its head. Under it are two crossed American flags. Above each is a banner with the words St. Paul. Behind the glass, in a chamber, lighted candles are placed to illuminate them. A smaller transparency below each bears the legend 1880 and, below the date, Temperature -20. Each bears the Russian Old Style date as well as the American New Style date. The dancing and festivities have been going on ever since Christmas. The first night after Christmas, the school hall was thrown open for a masquerade dance. There was little originality in costume except for the company men, who took pains with thiers and entered into the spirit of the fun. Dr. Kelly borrowed one of my dresses and went as the lady friend of an elegant colored gent. The pair furnished much of the amusement that evening. The natives did all the most beautiful Russian folk dances, which they have learned to execute to perfection. There seems to be no end to the variety of dances or to the stories they depict. The Aleuts love to do the dances and we love to watch. As the week passsed, more and more clever maskers appeared in the streets and at the evening dances. Most, in their quiet way, seemed to be enjoying themselves. Many, of course, by now have gotten themselves ugly drunk on kvas, which spoils the fun for the majority, who behave themselves exceedingly well. Last night, a few of the maskers stopped at the house. They came with the two concertina players and the fiddler and danced for about fifteen minutes for us, then went elsewhere. So well were they disguised that we could not recognize a single one of them. One was a bear, his costume so well devised that he looked like a real bear. Another had a polar-bear body and a white fox head. One was dressed like the Arctic hunter in Canulickie with his basket hat, tarbossas, and gun. He carried a bundle of real skins (worth a fortune back home) to keep in character. There was a fat man, well padded in white tights and a swallowtail coat, a mendicant with a broom and empty basket, a dark swell with patched particolored trousers, and others who have gathered an odd assortment of all kinds of clothes from rare visitors to these islands. At the end of this gay season, everyone who participated has to cleanse himself by a plunge into the sea wherever there is a crack in the ice or a hole made for the purpose. This is to rid themselves of the evil spirits that might have been lurking in the costumes. The custom is dying out with the younger generation, who are not nearly so superstitious as their elders and who also do not relish the idea of a cold bath at this time of the year. The old people, who still cling to the idea of purification from festivities and of starting the New Year cleansed, are more often taking steam baths at the bathhouse than plunging through the ice, which in the past has caused a few deaths. We have been fortunate in having stormless days for these holidays. But both John and I will be glad when the holidays are over and the island settles down again. I have been doing research on the Aleutian Islands for years and this is the only article that I have ever read that was positive. Usually the conditions between the Wild life managers and the pay scales of the sealers is pictured as difficult. It is refreshing to think that there was some sort of pleasntries happening on St. Paul. Thanks for the information on topic.I really like it very much.In 1879-80, the Pribilof Aleuts celebrated the Russian Orthodox Christmas it's a good day of all Russian.